Why Are Warehouse Heaters So Efficient? The type of activity carried out in the warehouse greatly determines whether your heaters will be efficient or not. You might be storing food items or chemical products in your warehouse. That means you require radiant warehouse heating systems to improve the energy-efficiency. When you have a very huge warehouse, the energy-efficiency will be reduced if you are only using a few heaters. It will take a lot of air circulation to get the heat to move from the source to where it is required. You might, therefore, have to reduce the size of your warehouse so as to make it more efficient. When you have a warehouse in which there are many obstacles, you are likely to lose a lot of energy before it reaches the targeted areas. This is because the shelves act as obstacles that block the heat before it spreads through the room. The shelves also absorb most of the energy making the warehouse heaters inefficient in the manner in which they deliver the heat. It is, therefore, prudent that you use fewer shelves in your warehouse if you want to make the heating system more efficient. For warehouse heating systems to be efficient, there is need for insulation to be applied on surfaces to prevent heat loss. However, there are some types of insulation which best prevent heat loss. In short, the reason why warehouse heaters are very efficient is the existence of insulation. A warehouse is bound to have doors and windows. When you leave the doors and windows open, a lot of cold air will be blown into the warehouse. That means your heater needs more energy to provide the normal amount of heat. By closing the openings and leaving the warehouse air-tight, you will be able to make your heaters more energy-efficient. 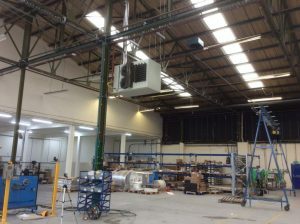 Now you know how to make warehouse heaters energy efficient. Buy yourself an ambriad heater and take action to make it efficient.